syosnow94 wrote: Alex if the 12z NAM verifies verbatim we’d all be 2-4” easy. Yupp, i strongly dislike changeover events (wet ground, NW winds cause downsloping and erode the precip, etc), however this event has strong jet energy moving over our area which could mitigate those factors (NAM is showing this), so we will really have to nowcast. But regardless, a flash freeze will occur. Ground will not dry by the time the cold air crashes in obviously. It looks like a 1 to 3 inch event in my eyes. There may be pockets of towns who see 3"+ if precip rates intensify. Frank_Wx wrote: It looks like a 1 to 3 inch event in my eyes. There may be pockets of towns who see 3"+ if precip rates intensify. 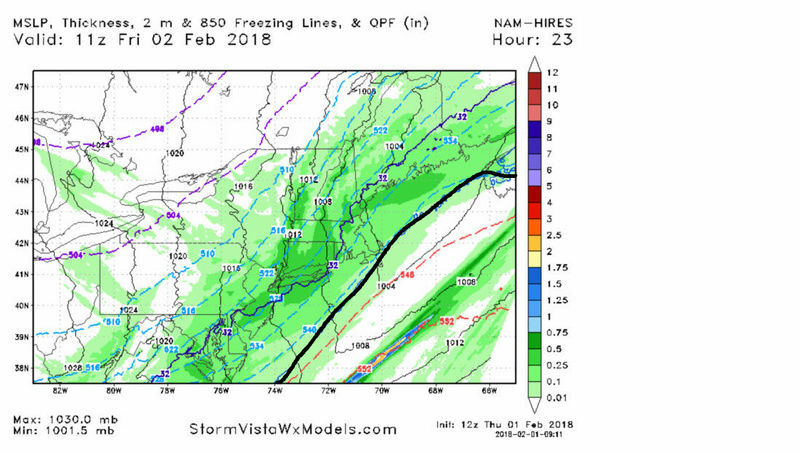 Is the 850 freezing line visible on this map and if so, could someone please point it out for me? And more directly, is coastal NJ in as bad a shape as it looks based on the 32 line? Thank you Sroc...so, I guess the cold air isn't much of a issue. I'm with Scott on this one, and have been. I like an enhancement of the precip field, but dissimilarly to the most recent event, I like this enhancement from east-central PA eastward, and from the approximate latitude of 295 northward. I think 1-3" would be a good call, as Frank had also stated. Intensifying mid-level energy in response to a change in the trough's axial tilt combined with a quick moving but potent jet max with the region defined above located in the overlap of forcings will allow the precip field to expand seemingly out of nowhere as, and after the low-level cold gets in. SENJsnowman wrote: Thank you Sroc...so, I guess the cold air isn't much of a issue. 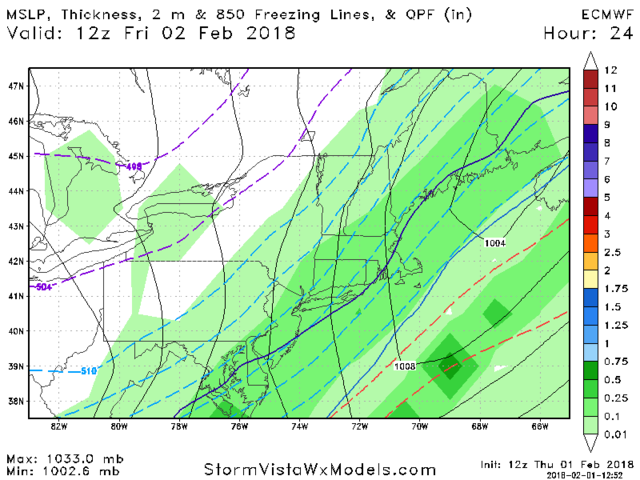 At least it wouldnt be for this model run verbatim. rb924119 wrote: I'm with Scott on this one, and have been. I like an enhancement of the precip field, but dissimilarly to the most recent event, I like this enhancement from east-central PA eastward, and from the approximate latitude of 295 northward. I think 1-3" would be a good call, as Frank had also stated. Intensifying mid-level energy in response to a change in the trough's axial tilt combined with a quick moving but potent jet max with the region defined above located in the overlap of forcings will allow the precip field to expand seemingly out of nowhere as, and after the low-level cold gets in. Scott, Rb great points made here. This is a anafront passage with a vigorous jets streak that will help enhance this on the backside. 1" for NW NJ to 3" out towards where else LI. Should be a fun commute tomorrow morning. Hi Res Models way to go here. amugs wrote: Scott, Rb great points made here. I'm worried about the a.m. too, rain going into a deep freeze will bring icing on the roads with the snow, not going to be fun for sure. AND here is the euro - my god this model has been wonky at best! Euro is a solid 1-3". Mike (Math23x7) did you see those maps? update to reflect current conditions. states. At the sfc, a cold front will approach from the west. dynamics don`t appear to be the reason for the higher values. especially across SE CT and eastern LI. 20s, possibly lower 30s in the NYC metro area. both periods. Temperatures will be very cold for this time of year. mainly from the mid 20s to around 30.
morning. Will address this potential in the HWO. except for maybe some light snow over far W Orange County. 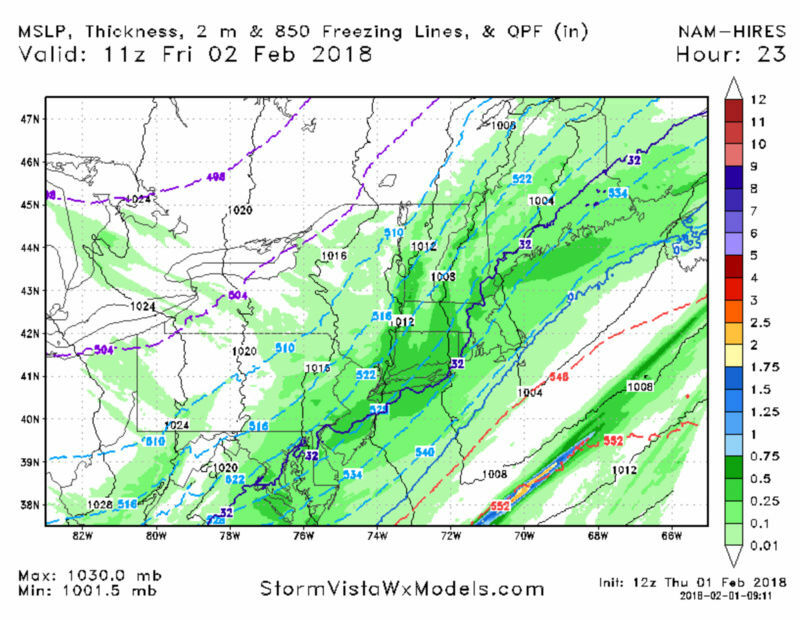 Welp the 18z NAM just gave the finger to the NWS and strongly supports our collective thinking that a nearly board-wide 1-3" event is in store for tonight. Happy thoughts, Syo, happy thoughts!! Actually looks better aloft than its 12z predecessor. 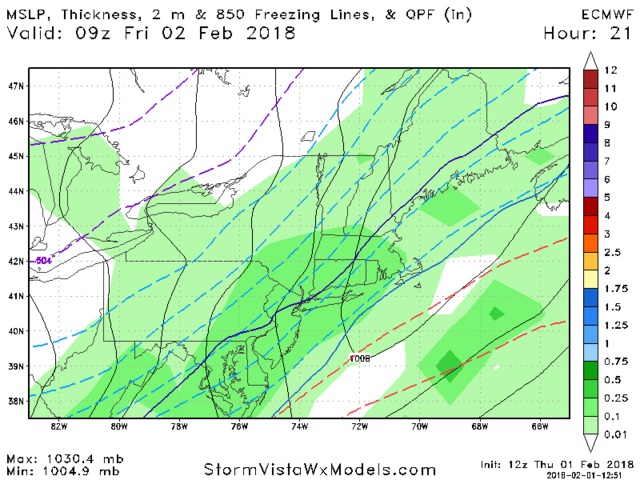 rb924119 wrote: Welp the 18z NAM just gave the finger to the NWS and strongly supports our collective thinking that a nearly board-wide 1-3" event is in store for tonight. Happy thoughts, Syo, happy thoughts!! I agree sysos, however as many have stated, the NWS tends to lean more to the conservative side, which is hopefully what will happen. I was hoping for a repeat of the cold we had back in early Jan.Something the main guys on the forum are still bullish about. Time will tell I guess. Rb and aianonne filled in the blanks while I was responding to you lol. Soundings show a changeover around 6am is in NNJ and cold air driving in just before this. If so it could be a treacherous commute manana. No one is really talking about this on SM etc. over to snow is an hour earlier than expected.